Last week, seniors visited eighth grade advisee groups during middle school break to talk with eighth graders about student life in the Upper School. 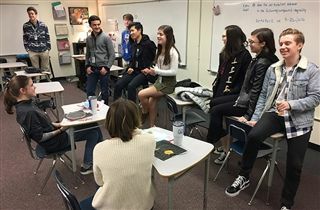 Seniors told eighth graders that they hoped to see them in the Upper School next year and described what they most appreciated about the Upper School’s academics, programs, and community. Some seniors even gave out some Endangered Species Project advice! Seniors, thanks for sharing your experience with the class of 2023.